A storage replication service is a managed service in which stored or archived data are duplicated in real time. A storage replication service provides an extra measure of protection that can be invaluable if the main storage backup system fails. Immediate access to the replicated data minimizes downtime and its associated costs. The service, if properly implemented, can streamline disaster recovery processes by generating duplicate copies of all backed-up files on a continuous basis. It can also speed up and simplify recovery from a disaster such as a fire, flood, hurricane or a virus. 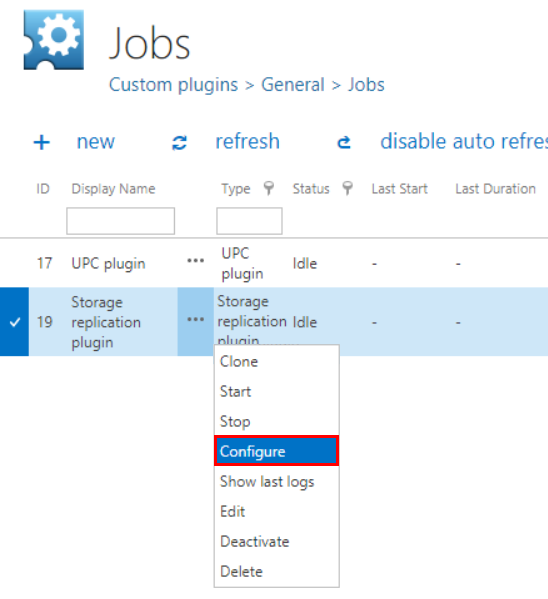 After you have successfully created a new job for Store replication plugin (for more information on how to create a new job please refer to section Creating new jobs in contentACCESS), you can start to configure the storage replication job. Navigate to the Custom plugins ⇒ General ⇒ Jobs, choose the job from the list. Click on ellipses (…) and choose Configure option from the context menu. A database of the Store replication job will contain the mapping data between the source storage and the target storage items. This means that after a failover of the main (source) storage this database will remember the mapping data between the source item and the target item, and a successful recovery from the backup (target) storage will be ensured. ✓ Scheduling settings: The storage replication job will run in times, which are set in the selected scheduler. On the screenshot below we have selected the “Always” scheduler, which will run the job without interruption. For more information on how to configure scheduler settings please refer to section Schedules described above. ✓ Storage settings: Within these settings it is necessary to set the source folder and the target folder(s). The source folder will be the primary folder. In case of any technical troubles, the required documents will be recovered from the secondary (target) folder with the assistance of data mapping saved in contentACCESS. ✓ Resource settings: Under resource settings it can be defined how many items/source folders will be simultaneously crawled. It is not recommended to set here a value higher than the duplex number of cores of the processor, as it will extremely slow down the whole processing.